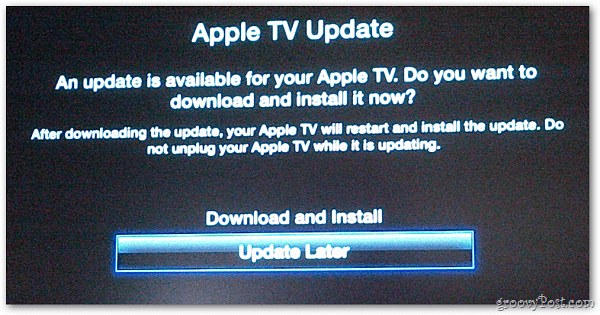 The Apple TV wasn’t left out of the OS update frenzy this week. 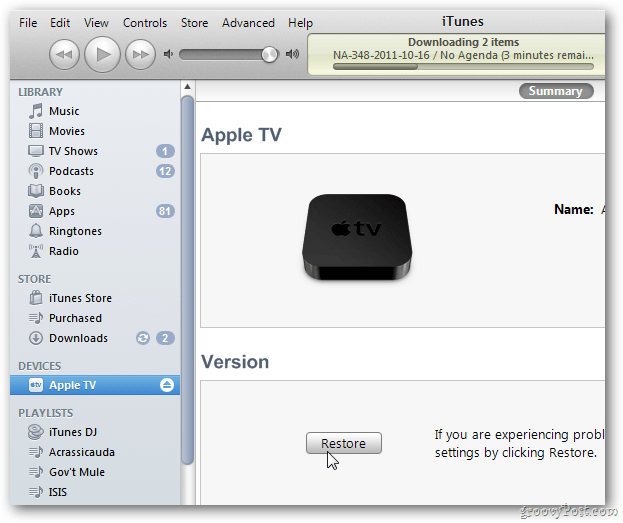 You can update through the Apple TV interface, or for a fast and clean upgrade – use iTunes on your PC or Mac. The easiest way to update, is use the Apple TV interface. From the main menu, go to Settings >> General >> Update Software. If you want to have a clean restore and update, connect it to your computer and use iTunes instead. Here’s how to update your Apple TV with your PC or Mac. First, disconnect the HDMI cable from your Apple TV, then unplug the power cord and Ethernet cable. Grab a micro USB cable and connect it to the back of the Apple TV. Note: You’ll lose any settings you have – if you don’t want to lose them, update through the Apple TV UI. Next, connect the other end of the micro USB cable to your PC or Mac. I’m using a PC running Windows 7 and iTunes 10.5. Launch iTunes and under devices you’ll see your Apple TV listed. Highlight it, and click the Restore button. After clicking Restore, you’ll get a few messages. I have automatic updates disabled so click check. 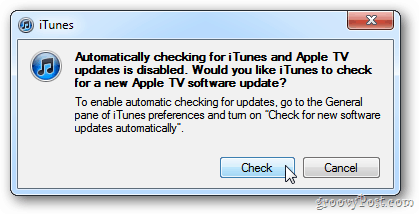 Then click Restore and Update on the next dialog asking if you’re sure. 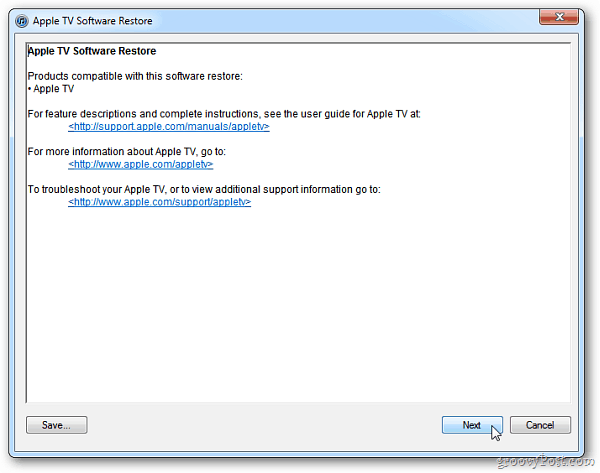 The Apple TV Software Restore window comes up. Click Next. 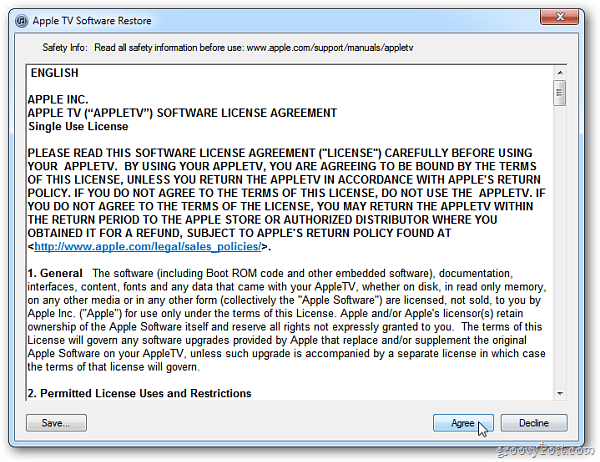 Agree to the Apple TV Software License Agreement. 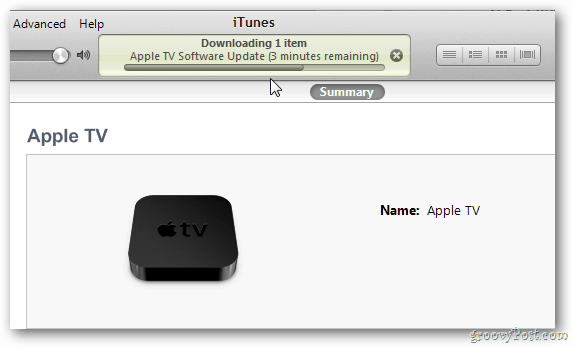 Then you’ll see the Apple TV Software Update progress at the top of iTunes. 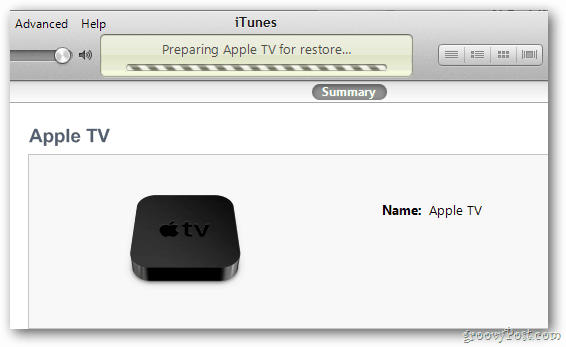 After the Update is downloaded and installed, your system will restore the Apple TV. When the update is finished click OK. Your Apple TV is now up to date with version 4.4. Unplug it from your computer and reconnect it to your TV. 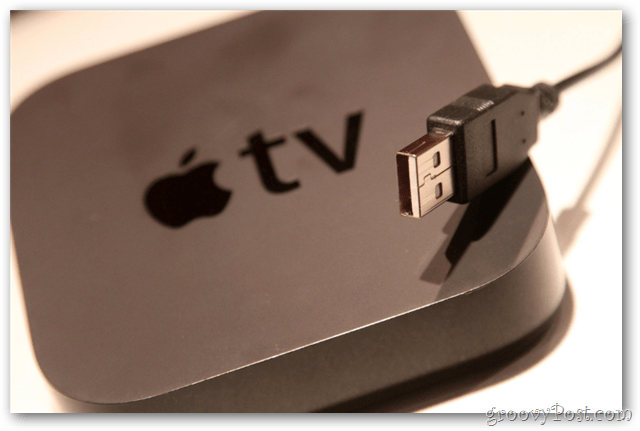 The Apple TV update includes iCloud features – Photo Stream and AirPlay Mirroring. New Internet TV channels have been added too. They include NHL – Live Games, Wall Street Journal Live, new Slideshow Themes, Netflix enhancements and improved navigation for iTunes Movie Trailers.